The Newdegate Machinery Field Days began in 1972 and are run by volunteer committee. Spread across the first Wednesday and Thursday in September, the Newdegate Machinery Field Days is an event that keeps our committee busy all year round and our community busy in the weeks leading up to our event. Our aim is to host a world class agricultural machinery display, which has now expanded to include livestock, family and recreational interests. The successful running of the Newdegate Machinery Field Days has enabled us to support our local community with donations to many local projects. I've been telling myself for the last 10 years, since moving to Mt Barker, that I should enter some work in the Newdegate Field Days art competition. I finally did it this year and decided that I should also go and take a look at the exhibition. It's a little under 300km by road from Mt Barker to Newdegate and it takes a little over three hours to drive there. It was a fantastic couple of days. My wife and I had two nights' accommodation arranged on a farm about 50km north of Newdegate. I sold both paintings at the exhibition, so had nothing to pick up and bring home. The weather was perfect - clear skies, warm, sunny days and still nights with starry skies. The 3,000 hectare (7,500 acre) farm features wheat and barley and around 3,000 head of sheep. Our wonderful host, Doug, gave us a tour of the property which features some amazing landscape painting opportunities. I was up and about at sunrise on our first morning and headed to a spot I'd noticed the previous evening, where a farm track deviates around a group of Salmon Gums. It's a simple landscape featuring a white sand track. I love white sand tracks and this scene was made for painting - so I painted it. It's not often that things are arranged exactly as you want them. Salmon Gums are beautiful, stately trees. The leaves are incredibly dark green and form massive canopies, sometimes resembling giant umbrellas. The trunks are pale and glossy so they change colour dramatically, depending on the time of day and the hue of the sunlight. I began with a rough wash of cadmium scarlet to tone sections of the board before laying in the painting. 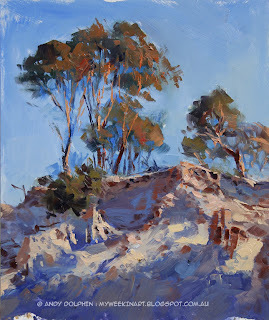 I used a limited palette of ultramarine, cadmium yellow light and cadmium scarlet - something I plan to do more of when painting on location. 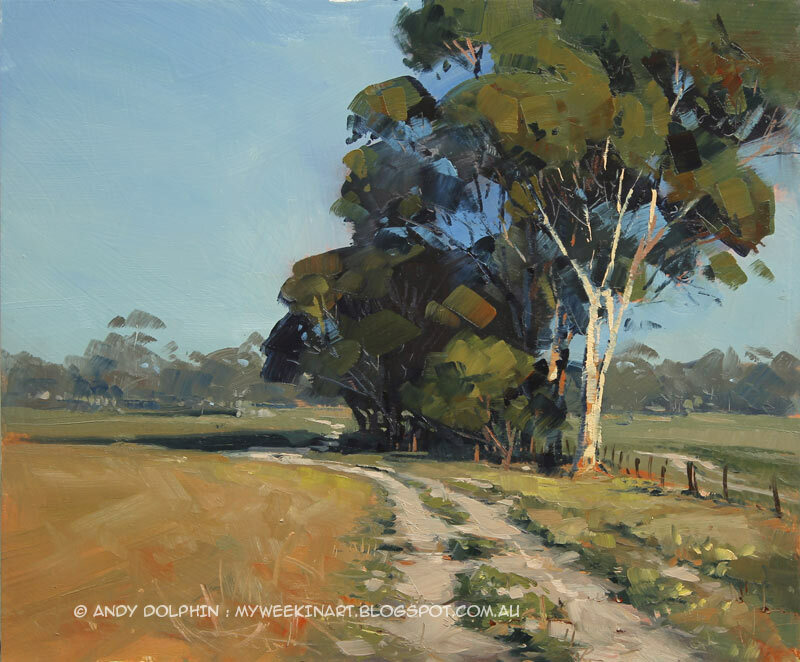 Most of the trunk on the main tree was added using a palette knife and I was really pleased with the result. While I was painting, a large flock of sheep moved through the shadow cast by the trees. If I do a larger version of this one, I might add the sheep in. That afternoon, I headed out to a spot where the mostly-flat land rises abruptly up a white limestone escarpment. The sun was dropping fast and I knew I was going to be pushed for time on this one. I had to think fast and make sure I got the most important shapes locked in before all the shadows had shifted. I painted for about 45 minutes, but the main rock face fell into shadow after about 10 minutes. I relied on a quick under-painting to guide me as to where the sunlit areas were supposed to be. I used the same limited palette as above but added permanent crimson to give me better purples in the shadows. Here's how it ended up. It's rough and suffers a bit in the composition department, but I think I've captured the general feeling of the spot. 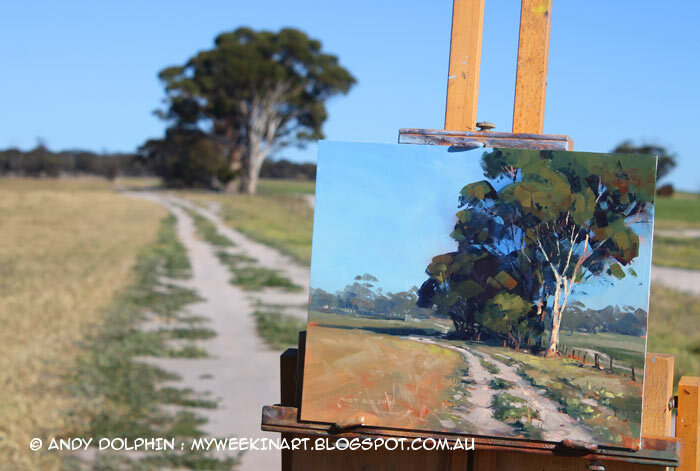 Between this plein air painting and a couple of location photos, I might be able to produce a decent studio piece. I don't have a shot of the painting on location but you can see me working on it in the photo at the top of this article. Big thanks to Doug for looking after us, showing us around and allowing me to explore the property. I've been enchanted with Salmon gums since the first time I saw them while travelling to Hyden a few years ago. Lovely painting! They're gorgeous trees. I need to head north-east more often - they're everywhere out there.